I have recently transferred some (okay, a lot) of Sunshade's puppy footage from VHS to files that I could work with on the computer. I'm thinking to share some of them with you, to show you what a SuperSPECIAL pup she was right from the start, and tell our story. There is a lot of material to go through (and I have not gone through them all yet), and of course, these are footage I have not seen in 12+ years!! Most of you know about the special, unsurpassed bond that Sunshade and I share with one another. It is a bond that I know will/can never be replicated. Reason being, the circumstance at which we came together, and grew up together was not your everyday "stable, loving family gets a puppy and raises the puppy". Our beginning was far from a fairy tale. I was in a pretty dark place as a 15 year old, watching an extremely unpleasant, undiplomatic divorce unfold at home. My father, who is about the most responsible family man, loving father I know, felt guilty about all that was going on at home. He asked me what I wanted for my upcoming 16th birthday, and I told him a PUPPY!!! I used to get very serious asthma attacks growing up in Taiwan, so I was never allowed to interact with animals for the fear that they may trigger an attack. The more that I was separated from animals though, the more attracted I became towards them. After moving to Canada in 1996, my asthma went away miraculously, and my obsession towards animals grew. Dogs, in particular. Not knowing anything about dogs, and their needs/care in general, my dad and I had no idea that bringing a pup into a situation like this was less than ideal... (actually, quite cruel in this case due to the way things unfolded that were out of my control). It is very bitter sweet going through these tapes. Sweet, because Sunshade was just the cutest thing. It was very obvious how smart she was, and how much she was willing to do for me even at such a young age. Bitter, because I'm being reminded of what a horrible puppyhood she had; my lack of knowledge in dog care and training, the endless hours she had to be on her own while she cried herself hoarse in exile, all the bouncing around that came afterwards, and the horribly cruel training method that was used due to the trainer that was recommended "for an Airedale". When my father agreed to get me a puppy, he told me to research the breed that I wanted. It was a no brainer. I knew exactly which dog I wanted. I had met a scruffy grey dog a year prior, and totally fell in love with the looks of that dog. 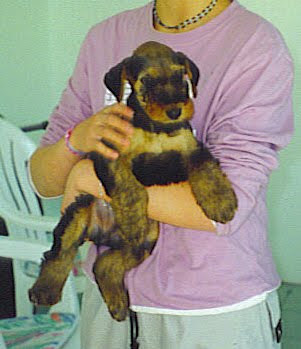 It was a Standard Schnauzer I wanted! Except.... I didn't know what the breed was called. So with great enthusiasm, I went to my school library that had a black and white poster of all the different breeds of dogs. I went through the entire chart (or so I thought) and wrote down the names of the breeds that that I thought "looked" like a SS. 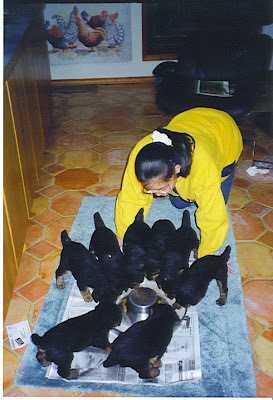 They were: Airedale Terrier, Irish Terrier, Lakeland Terrier, Welsh Terrier, Wire Fox Terrier, Miniature Schnauzer. HA, you guessed it, I zeroed in onto the Terrier Group, completely missing the Working Group, where Standard Schnauzer would have been in. So armed with those breed names, I went to a book store and bought a dog breed encyclopedia. I read up the description of all the breeds above, and decided that an Airedale was what I wanted. 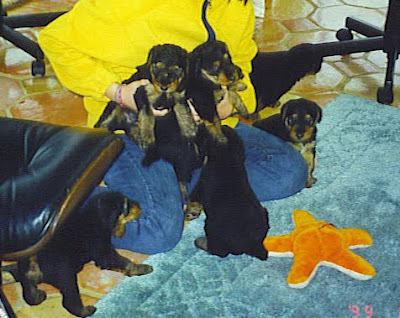 Upon seeing the coloured pictures of the Airedale, I did realize it was NOT a SS that I was choosing. It didn't matter though. I thought the Airedales were better looking :-) What really sold me on the Airedale was the part where it said "aloof to strangers", "a loyal companion", and "protective of its master". Perhaps those points seemed attractive to me because that was what I was craving for in my life at the time. SO, we had the breed picked, where to get the dog?? Having never had a dog, and totally, utterly clueless about the dog world, naturally, we thought, PET STORE! You want groceries, you go to grocery stores. You want a pet, you go to a pet store don't you? Seemed reasonable at the time anyway. There was this pet store about half an hour away from my school. I used to take the #2 bus after school to downtown Victoria (BC, where we lived), and than transferred onto another bus that took me right outside the mall complex in which the pet store was located at. I would go in there and watch the puppies play behind the windows. 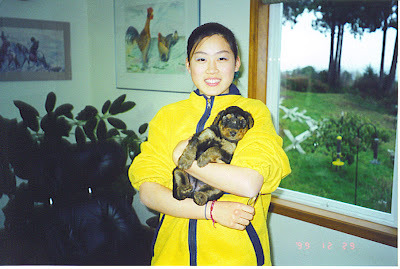 I should also mention that my dad had a schedule where he would work in Taiwan for a month straight to make money to support the family, and then come to Victoria the following month to spend with the family. My mother, who will be referred to as "T", was around, but she was too busy with the neighbour down the road. So during the time that my dad was in Taiwan, I would basically care for myself, and sometimes my younger brother when T had to go "buy milk" until the next morning. Anyway, back to the pet store... 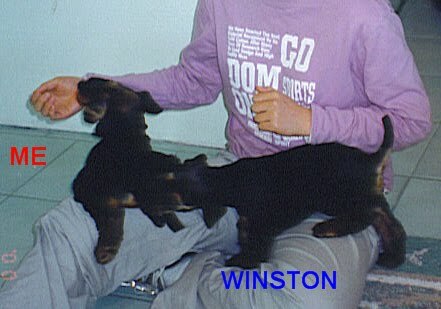 I "ordered" an Airedale Terrier puppy from them. Gosh I was naive back then! I even gave them details on what I wanted my puppy to look like. I had read an Airedale breed book that (now looking back) had the breed standard written down. So it would say something like the eyes should not be too big or too round. So I wrote all that down on a piece of paper; medium sized eyes, not too round, triangle ears, straight tail etc, and handed that piece of paper to the pet store clerk. He very nicely took the paper, and my $500 deposit (thank you dad!). I remember he assured me that he would find me the perfect pup. I was not quite 16 at the time. I don't even know if it was legal for him to take an order from me?!?! Now knowing what I know about pet store puppies, I would have been lucky to just get one without health and temperament issues, nevermind size of the eyes!!! Fast forward 3 months later, still no pup. I was going to the pet store THREE times a week after school just to see if I could see an Airedale puppy behind one of the windows. Nothing for 3 months. One afternoon, I arrived at the pet store to a sign outside that said they had declared bankruptcy. I could still remember the disappointment I felt as I sat outside the now closed pet store for at least another half an hour just trying to process everything. Afterall, I thought pet store was the only place one could acquire a puppy! I called my dad who was in Taiwan at the time, and told him that we lost $500 and no puppy..... Our conversation ended with my dad telling me that he would find me another pup when he came back to Canada next month. And he did!! Internet was still so "new" to us in 1999 (how many of you remember ICQ messaging? 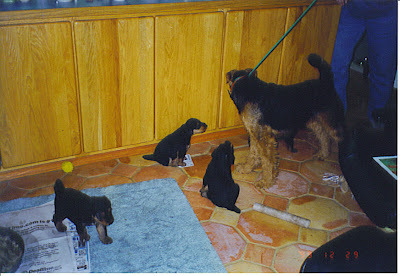 ), and somehow, my dad missed all the Airedale breeders here in BC, but found Loc Aire Airedales in Port Angeles, WA. At first, Jan Mell, breeder of Loc Aire Airedales was very reluctant to give us a pup after grilling my dad for an hour on the phone. She told him that she wasn't too keen on placing one of her dogs with first time dog owners. In the end however, my dad's wonderful, sappy divorce story got to her, and she said she would make an exception for us if we were committed. 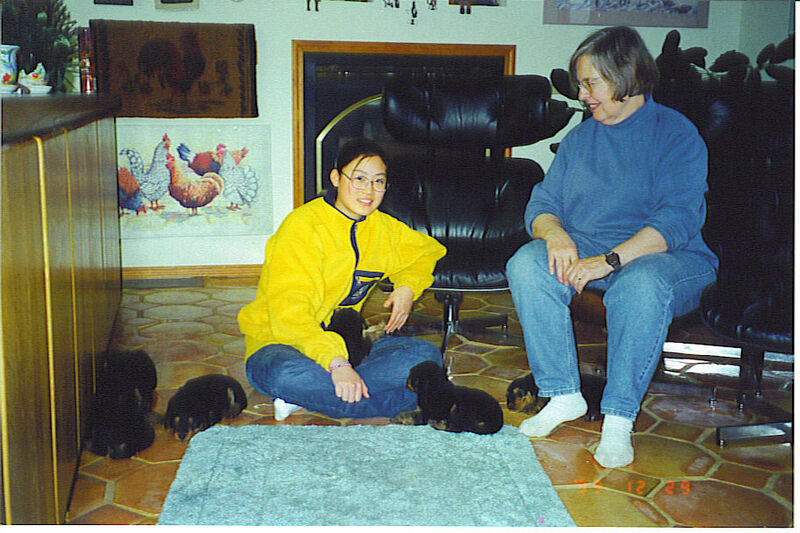 Of course, we couldn't tell Jan that the pup would be alone by herself for 8+ hours every other month when my dad was away in Taiwan... so we lied a little here and there just so we could secure a pup (yes, I know, shame on us). T was home, but I didn't expect her to help with a pup when she couldn't even be a mother. Finally, Jan agreed to let us have a female pup from the litter that was going to be due "any day now". 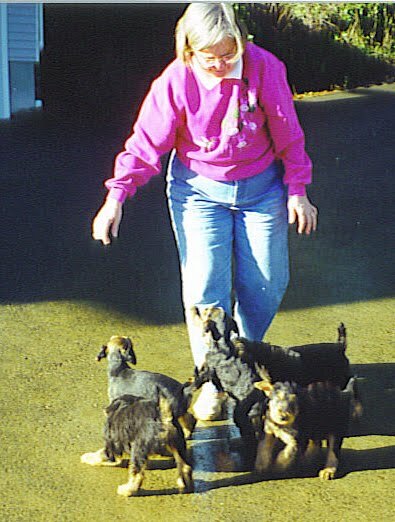 She mailed us 5 books to study, and told us to go visit her and the pups at 5 weeks. These pictures were taken from our visit when they were 5 weeks old. When we went to pick up our puppy two weeks later, Jan told me I could have "point on the nose". She didn't say why, but my guess is because "point on the nose" turned out to be sheepcoat, which meant she couldn't be shown or bred. "Point on the nose" also tested all "3's" on her puppy testing, which meant she was a pup that could do well in any type of home. So I got the girl I wanted!! Introducing.... Miss Sunshade - Baby SuperDALE! This video was taken immediately after we brought her home. She was only 7 weeks and 2 days old. I had totally forgotten that the ferry from Victoria, BC to Port Angeles, WA was due to go into maintenance for 3 weeks. Jan, our breeder had wanted us to pick her up at 10 weeks, but I didn't want to wait another 3 weeks... So Jan allowed us to bring her home given her stable test result. Sunshade tested all "3's", which meant she was a pup with good foundation. Please keep in mind when you watch these videos... we were brand new dog owners that had no previous experience at all. I had read in the Airedale breed book that they needed a "firm handler", so I was trying to be "firm" (however I defined it as..). I do feel extremely bad now, when I watch these footage. Wish I could turn back time and make her puppyhood much better and easier. I read in the Airedale breed book that the dog pretty much matures appearance wise when they reach one year of age, so I told my dad that we had to take photos and videos of Sunshade each week until she turned ONE! So here we are, 8 weeks old doing training with mean mummy who had just came home from a figure skating practice. Sunshade was 9 weeks old here. My dad had gone back to Taiwan for his month long work period, so it was just me and my Sunshade girrrrrrl. I was keeping up with the weekly photo/video sessions. Every morning, I would get up at around 5am to play and spend time with Sunshade before I had to leave for school. 10 weeks old and full of beans! You will see I took her ears off half way through the video, she looked so cute with the floppy ears! "If you don't get your dad to give me X amount of money by Friday, your puppy will be given away." She went on to tell me that she had contacted a pet store that was more than happy to take a pedigreed puppy. You see, T knew my dad would sacrifice anything for his kids, just so they wouldn't have to suffer. So I guess I became her bargaining chip to get my dad to give in to her demands. She also told me on that day that Sunshade would be banned from upstairs. The only place Sunshade was allowed to be was in the basement, until Friday. I thought a lot about the ultimatum that was given to me. Ultimately, I decided that it was best to return Sunshade to Jan, our breeder. I didn't want my dad to give in to T's demands, and secondly, I was feeling very guilty for having to leave a puppy on her own all day while I was at school, not to mention, she was now being isolated in the basement. So I called my dad to let him know what was happening, and what my decision was. I also told him that I would like to move out once Sunshade had gone back to Jan's as I would not be able to look at my mother without feeling a certain level of resentment. My dad, who was always so calm and rational, told me to just hold tight until he was able to make shift changes with work to come to Victoria earlier. One thing that's for certain looking back at these tapes is that having little Sunshade around was definitely therapy for me, and I sure needed it. I was constantly talking to Sunshade, telling her my thoughts and feelings whether she listened or not. I am including a video link below. It's an almost video diary except you get to watch baby Sunshade. You may choose to skip this video all together, and you won't miss anything. It's a bit embarrassing for me to listen to this video because I could hear what a sad, troubled, 16 year old girl I was, even if it was some 12 years ago. Still, I feel compelled to include it because it is part of our story. How Sunshade helped me. In case some of you were wondering, T doesn't dislike dogs. In fact, for the last six years, she's had a small breed dog that she spoils and takes everywhere. When the dog charged and nipped at me continuously a couple years ago during my visit to see my brother, T comforted the dog and said it had every right because I was in its house. 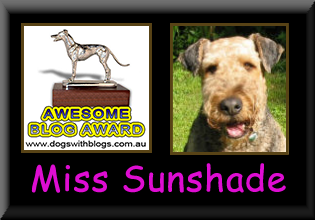 My point is, the way she treated Sunshade had nothing to do with her disliking dogs. She just disliked MY puppy that my dad had gotten for me. Somehow Sunshade and I = my dad, and to get at my dad, she knew she just had to get to us. Anyway, I continued to love and care for Sunshade the best I could the week leading up to my dad's arrival. Sunshade was also due for her second set of puppy shots. I was too young for a car then, and couldn't take Sunshade on the bus with me. So I enlisted a few of my older friends who could drive, to take me to the vet clinic with Sunshade. Look at what a great patient she was right from the start!! To be continued..... until I have more time to go through the tapes! Sunshade already so Smart when she was a puppy. What a fantastic post, Elaine! There was a lot of smiles and tears here. Sunshade was a special girl right from the start! You were doing a heck of a job at 16 years old! I can't wait to see more! Thanks for sharing with us. you should bind this into a book when you are done. Sunshade & YOU are both exceptional. Someday we must meet! Hi E: This is a gutsy thing to do. You and SS look so good together. I knew you two have a very special bond but not all you had to endure when you were so young. Thanks for sharing this first part of your journey! I loved reading this Elaine. Ps -- my makeup was nearly identical at that age ;) You are so cute. Loved reading your story. You are very good in your writing. And young lady, always remember that one of best traits of Airedales are that they are very forgiving !! !